I realize that it has been a little while since I posted a recipe. It isn't that I'm holding out on you guys! It is simply that I'm in somewhat of an uninspired patch with food at the moment. I'm spending my mental cycles on clearing out my chattery brain by means of nature hikes and yoga instead of daydreaming about cookie dough and sun-dried tomatoes (separately, of course). I've been eating simply, getting take-out, and still working on using up what I have in the pantry when I can. That being said, though, some thoughts of take-along foods have been swirling around in my head because I have been day-tripping and picnic-ing as often as possible lately. We brought a picnic lunch along for our Big Tree hike and, just today, I packed yet another for a day trip to Donner Lake in Truckee, CA. 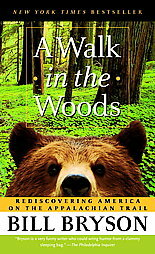 *Book recommendation: Speaking of the great outdoors and packing food along for a hike, I just finished reading A Walk in the Woods by Bill Bryson. I loved this book. LOVED it! Bill Bryson is absolutely laugh-out-loud hilarious and this book is now one of my all-time favorites!